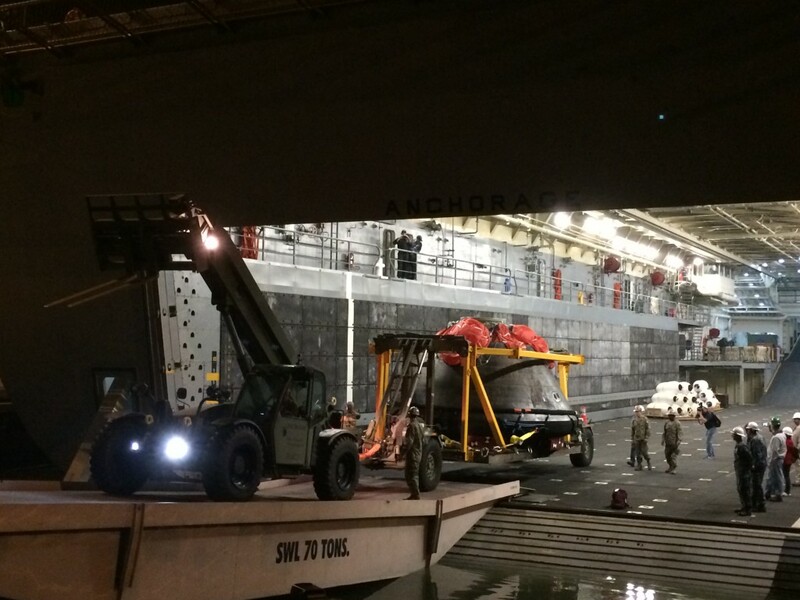 The Orion spacecraft was off-loaded from the well deck of the USS Anchorage Monday night after the amphibious ship docked in San Diego. The ship’s crew along with NASA and Lockheed Martin teams retrieved the spacecraft from the Pacific Ocean at the end of the highly successful Orion flight test that saw the Orion fly about 3,600 miles above Earth in a 4.5-hour evaluation of critical systems and mechanisms including jettison events and the ability of the heat shield to stand up to temperatures of 4,000 degrees F. Next up for Orion, a trip cross-country back to NASA’s Kennedy Space Center in Florida. Orion is traveling by truck across the country. Will it be making any “publicity” stops, such as in Houston? NASA does not plan to make any such stops. Orion will be traveling back to Florida by truck.